South of Antibes, the terrain winds itself into a peninsula with luscious Cap d'Antibes at the tip. The busy bustle of Antibes gives way to lush mediterranean vegetation that borders a spectacular bay studded with sailboats. The beaches that border the sheltered bay are of fine, white sand and several are open to the public. With such a spectacular natural setting, it's not surprising that Cap d'Antibes is one of the most exclusive addresses on the French Riviera attracting tycoons, financiers, the quietly rich and the flamboyantly rich. Transient millionaires station themselves at the Hotel Eden Roc. At the right time of year, they can rub shoulders with the movie stars that stay there during the Cannes Film Festival. Humbler folks can also take pleasure in the attractions of Cap d'Antibes. The beach closest to Antibes is the Plage de la Salis, a pretty, sandy beach with a beach shower. It's at the northern tip of Cap d'Antibes. The most magnificent beach in Cap d'Antibes is the calm, protected La Garoupe beach where your gaze is treated to the sight of the Mercantour mountain range in the distance and the walled city of Antibes nearby. Part of the beach is "managed" by private beach restaurants which means you have to rent a lounge chair for the day but part of the beach is open to the public. 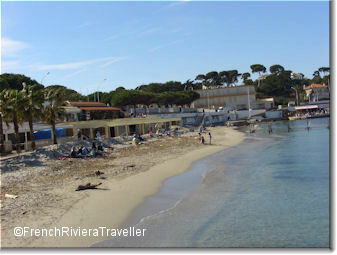 On the western side of Cap d'Antibes is the unpretentious Plage des Ondes which is a tranquil public beach. From La Garoupe beach, take the beachside walkway known as the Chemin de Tirepoil which winds around the tip of the Cap and offers spectacular sea views. You can take the walkway to Villa Eilenroc, a sumptuous 19th-century villa built after the designs of Charles Garnier. You can visit the gardens every Wednesday afternoon even though the villa interior is closed to the public. A little further on you come to the Napoleon Museum in the reamains of a battery. Another highlight of Cap d'Antibes is the Thuret Gardens, created by the botanist Gustave Thuret in 1857. In addition to its beauty, the gardens serve an important horticultural purpose. 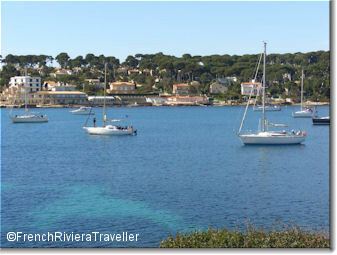 From central Antibes only Bus No 2 goes to Cap d'Antibes, stopping at the Hotel Eden Roc and at La Garoupe beach. See the Antibes/Juan-les-Pins tourist office.